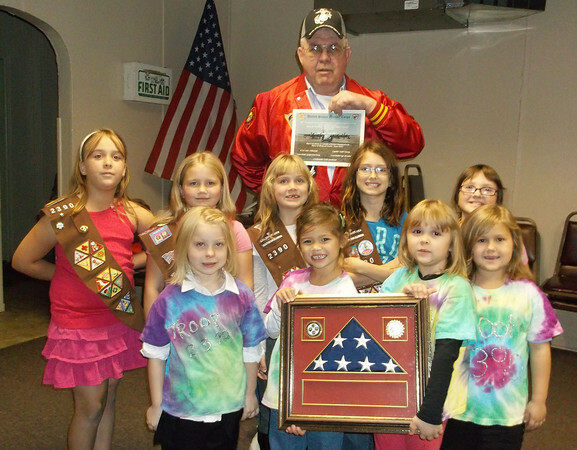 A flag that was flown over Afghanistan was presented to Girl Scout Troop 2390 at the Girl Scout Cabin in Effingham. The troop heard from veteran Darrell Schwerman about the significance of Veterans Day and the flag, which was sent back by Marine Sgt. Matt Nothaft, who has a relative in the troop. Also pictured, front row, are Madison Meyers, Kaylie McElroy, Maggie Jenkins and Ember Hutson; back row, Megan Jenkins, Rachel Graves, Grace Mason, Cadence Florida and Sydney Harvey.